Property Service and Network Connections - An endorsed consultant can design and certify your connection, as well as manage the application and construction process. The following companies are approved by Queensland Urban Utilities to undertake field testing on our hydrants. Any contractor with the appropriate qualifications is permitted to construct a new Property Service or Network Connection. We recommend you talk to your engineer when selecting a contractor. Standard connections are undertaken by our construction partner, Ventia. 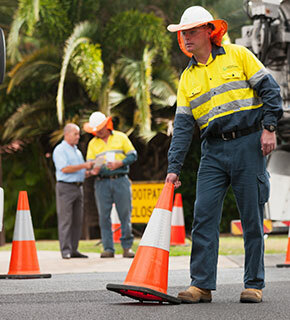 A Queensland Urban Utilities accredited valve turner is required for connections undertaken by contractors via a Network Access Permit. No other companies are permitted to turn valves on our network. liaising with Queensland Urban Utilities about critical customers. Advance notice required for weekend bookings.